It's time to recline. 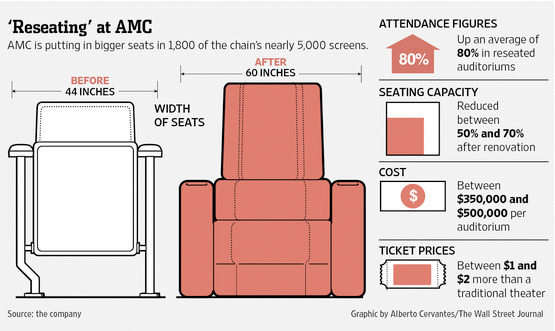 There's a big story in the Wall Street Journal this week highlighting plans from AMC Entertainment to install more recliner seating in some theaters, while taking out the old crappy style seats in the process of upgrading. The article defends some flack from external criticism about how removing seats just doesn't "make sense" but goes on to explain, with quotes from AMC's CEO Gerry Lopez, that they believe it will be better off in the long run if they put in these recliner seats. Yes, they will eventually charge more for them (but not right at first), and they won't be in NY or LA, but it's still cool to see this happening. Oddly, in New York City there aren't a plentiful supply of recliner theaters so I can't say I'm lucky enough to have this experience, and they explain why that's the case. "Busy venues in major markets like Los Angeles or New York don't need cushy seats to attract customers, so it doesn't make sense to cut their capacities." So they won't get the new recliners and won't have their current seats torn out, which, I suppose, makes some sense. But then again, I look at photos like this (below) and think, man, that looks wonderful. I would love to see all movies that way. As long as there are no other distractions… but if these seats existed, I would be at this theater quite often. Wouldn't you? I'm curious to try these elsewhere or just wait for them to get here. For those concerned about extra costs and how much AMC is planning to make off of customers, well, it won't be that bad. "AMC Chief Executive Gerry Lopez says he is now banking on quality over quantity. AMC plans to wait about a year after upgrading its theaters before raising ticket prices." Okay, but how much? They explain: "AMC typically doesn't change ticket prices in the first year after construction to 'seed' behavior, said Mr. Lopez, but the admission fee goes up in subsequent years. Then, if a regular theater raises ticket prices 25 cents, tickets to a reseated auditorium might go up $1 or $1.25, he said." Now you know. If you go to the movies and sit in these seats, you're "seeding" this, and will be part of the price raise when it inevitably hits. But that's how it works. Can't fight that system, especially when they have such nice seats. @gerardtbaker @firstshowing Now if they'd just "rip out" the loudmouths and phoners, the experience would be perfect. For now it sounds like it will take a few years for the renovations to be completed across the country, but at least they're on the way and AMC is at least trying to make the experience at movie theaters better. If only they would work on other distractions, in addition to making the seats comfortable, then maybe we would all be back at movie theaters more often. For those hoping that recliner seats may eventually come to "busy venues in major markets" near them, they do say: "In a second wave of conversions at better-performing theaters, AMC is planning to install seats that don't recline as far back, so just half of the capacity is lost." Those may end up at some of the more popular venues, so be on the lookout for renovations coming soon. 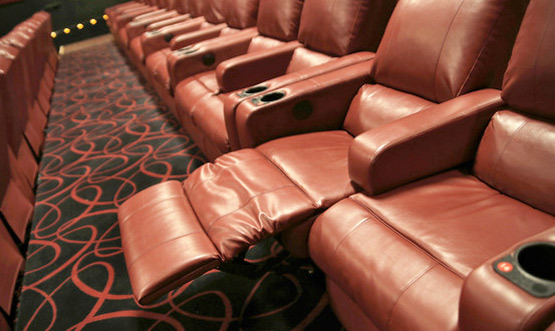 If you live near any theaters upgraded with recliner/couch seats, let us know if you think they're worth it. Do you go to the movies more if the theater has nicer seats? Do you think it'll make a difference at AMC? One of the AMCs near my house was renovated with the new seats almost a year ago, and I haven't had any issues so far with the seats being disgusting. The only issue I have found is that the sound the seats make when reclining can be a little bit annoying. I imagine one would pretty thoroughly torture test these before outfitting thousands of seats in literally thousands of theaters. I would hope they know what they're doing. The AMC theater I frequent was one of the pilot locations, and they've been going strong for almost 2 years now. In many ways, they're actually cleaner than the old ones since it's easier to wipe down pleather/leather than traditional cloth seats. There's actually an AMC theater in NYC outfitted with recliner seats in all of their auditoriums, it's the one on 84th and Broadway. Yeah that's what was preventing me going to the theatre. Not comfy enough. There's a movie theater called Cinepolis Luxury Theaters that has been ahead of AMC with reclining seats and in seat dining. Because of Cinepolis I like going to the movies alot more than when I was a kid. I'm totally open to this idea. It's better than having to find a seat with no one in front of you to put your feet up on it. However, all we have in town (Fresno, CA) are Regal theaters....so this really isn't a big concern here. Lol, they've had this in Australia and Asia for years. The AMC in my town has had these for a few years, they're fantastic. Does the recliner massage your balls too? If not, then im just meh about it. Please don't turn into the Alamo. Just went to one and it sucked hard, especially because of the food, but also the Nazi rules. This isn't going to work, trust me. lol. you got kicked out for texting, didn't you? Uh, no. But if you like to see movies in places where you're treated like a prisoner in Abu Ghraib, this might be the place for you. Some people like to pay for this sort of treatment, I guess. next time bring your parents and they won't kick you out for being underage. lol. Does it make you feel superior for taking abuse? No but laughing at whiners who can't show self control in public places feels kinda tingly. Do you really think people are going to enjoy seeing a movie at a theater with nasty smelling food, roaming servers and ushers and a behavior policy that rivals most concentration camps? Good luck. Do you see AMC or any other big theater chain copying this practice? That should tell you everything about how stupid it is. Seriously, for the last time, I did not get kicked out. The movie I was watching was too good, otherwise, I wouldn't have cared. oh, so you waited until you hit the internet before you bitched like a girl-scout with a skinned knee. Why would they have to raise their prices? They already increased their food prices as well as ticket prices. They put the recliners in the Prime theater which charges you 5 more bucks. So Matinee 7.50+5.00+5.00 for fancy seats and sound plus 3D. There were less than 10 people in the theater as well. Now drinks are self serve. So since we have to provide the labor for our drinks maybe lowering the price? There is a reason why DVD sales/rentals and Redbox and Netflix have made huge gains. I have very seldom been in the theater with a packed audience. This is LA btw. Last year AMC opened a reclining seat theater 5 minutes away from my house. Takes awhile to get used to reserved seating and knowing what seats to pick. Absolutely love the seats and this theater. Shows before 12 are only $7 each. Love that you can go online, reserve your seats, and go into the theater after all the previews. You don't have to rush or watch the previews if you don't want too. Awesome experience. They installed the fully reclining chairs in all the screens at the Fallbrook multiplex in West Hills, CA (Los Angeles) about a year ago. And are beginning installation of the new seats in Santa Monica, CA. So much for not doing it in LA. The AMC @ Lincoln Center in NYC has a great Hugh screen & sound system but terrible old seating that feels like your sitting on a wooden chair! I'm 6'2 a feel a little cramped in there also... This is NYC! AMC needs to step it up @ this location for $21 per seat!!!! I live in a suburb of San Antonio, 30 min trip to the AMC Rivercenter that has had recliners for more than a year. I have gone to 7 or 8 movies since I discovered this theater, only 1 at another theater. At 50 yrs old, with 2 knee surgeries in my past and now a neck injury, I won't go to any other theater. And even with seats reclined, there is still more room to exit to the aisle than in a traditional theater. The clincher for me, though, is the ability to reserve specific seats when buying tickets online. I have to think that us older folks will spend a little extra, and drive a little further, to not be in pain during and after a movie. Recliners are popular because people are getting too fat to be comfortable in regular seats.